These were my first pair of trail shoes. I chose them because Adidas shoes seem to fit me feet pretty well and I liked the aggressive tread pattern and the design. I have to admit that in order to get the sizing right I did try a pair on in a running shop and then ordered them online because I specifically wanted this colour scheme and I couldn't find a shop that stocked them. The photo above is from the day they arrived in the post and from about an hour after this photo was taken they were covered in mud - a state that they've been in ever since. 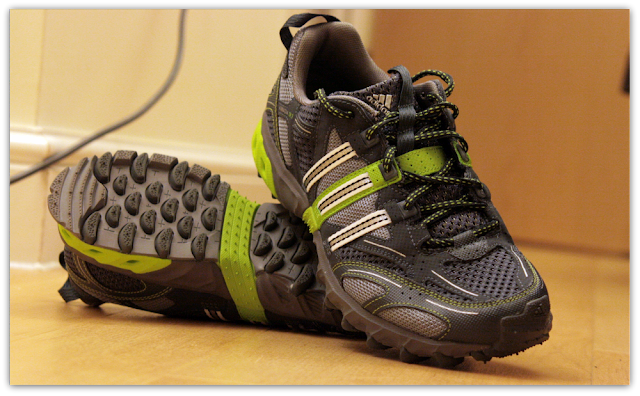 They helped me really get stuck into running on the trails and mud without worrying about the after effects. I have a 'no wash' policy with these shoes. In my view trail shoes were never destined to be shiny and clean. They apparently weigh in at about 340grams, but I'm guessing mine mostly weigh more due to the selection of mud they permanently carry around with them - However I do knock most of it off before it dries. The only time they are ever anywhere near clean is straight after running in the snow. As of June 2013, they now have 523 kilometres on them - most of those kilometres have been run at Riddlesdown parkrun, where I also ran my current 5k personal best in these shoes. I see quite a lot of runners at trail races or at muddy parkruns wearing these, so they are obviously a very popular shoe. This is another shoe that I absolutely love - They have kept me upright on even the worst slippery, muddy runs and I would gladly buy another pair of these without hesitation. At time of writing, Adidas are on version 5 of this shoe. However, they feel different and not in a good way.